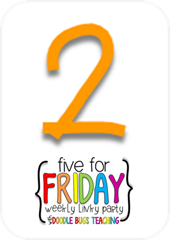 It's Friday of a long weekend! 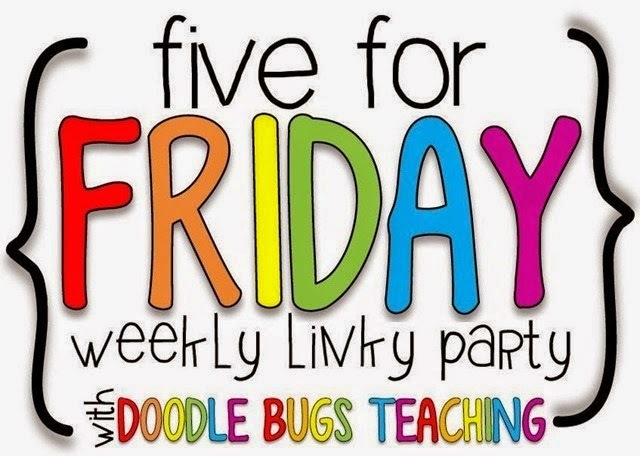 It's also time for Five for Friday with Doodlebugs Learning. Each week the first graders get a spelling list. 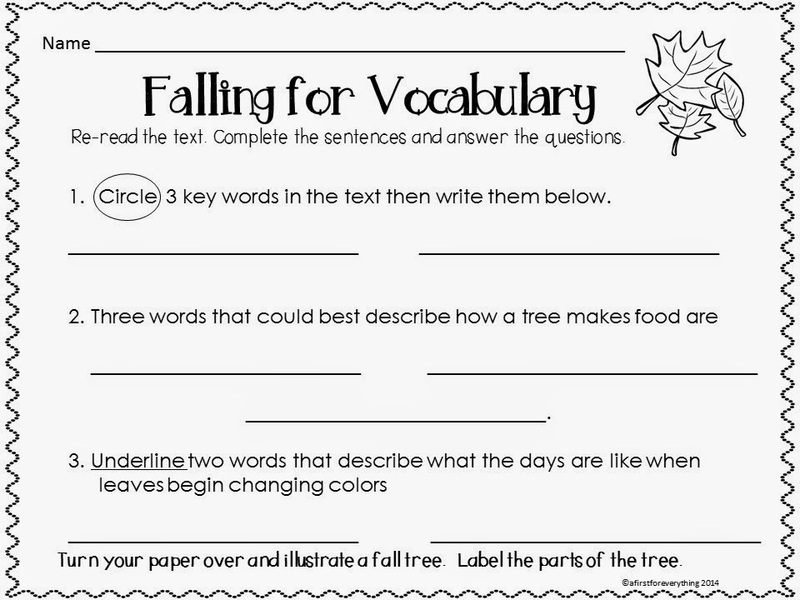 The list consists of 8 rules words, 4 sight words, and 3 optional content words (usually seasonally based). 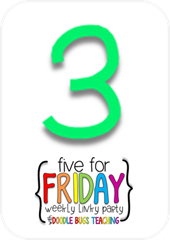 They get their lists on Fridays, study the words and the spelling rule all week and they have their spelling test the following Friday. This was our first week. The spelling rule is: Blend 2 sounds with a short vowel "a" in a closed syllable; a closed syllable has one vowel followed by at least one consonant. The vowel sound is short. First, we learned what a syllable is. We sorted words by their number of syllables. 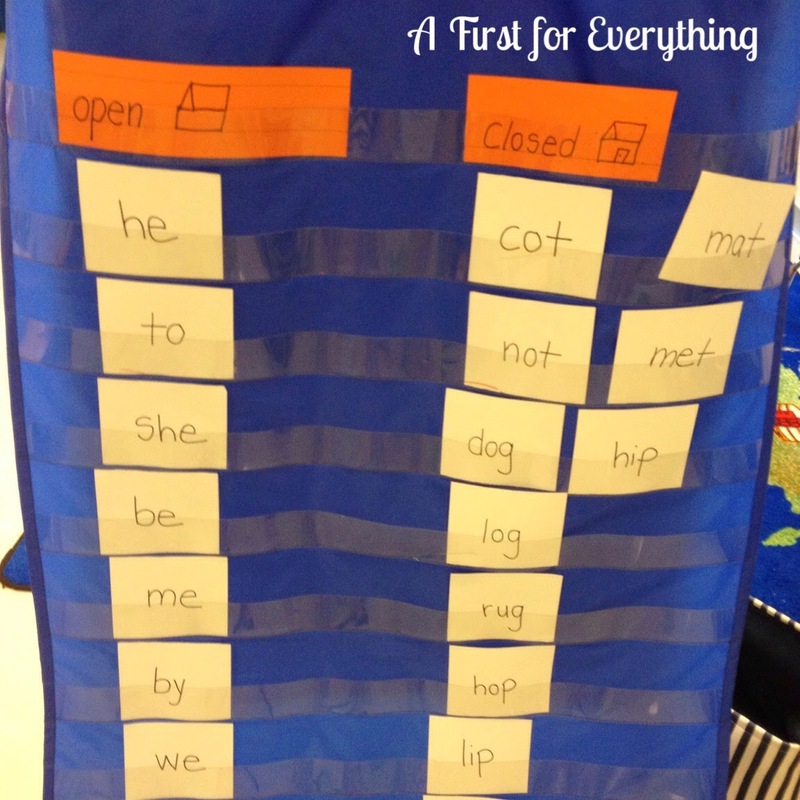 We also sorted words by whether they were closed or open syllable words. 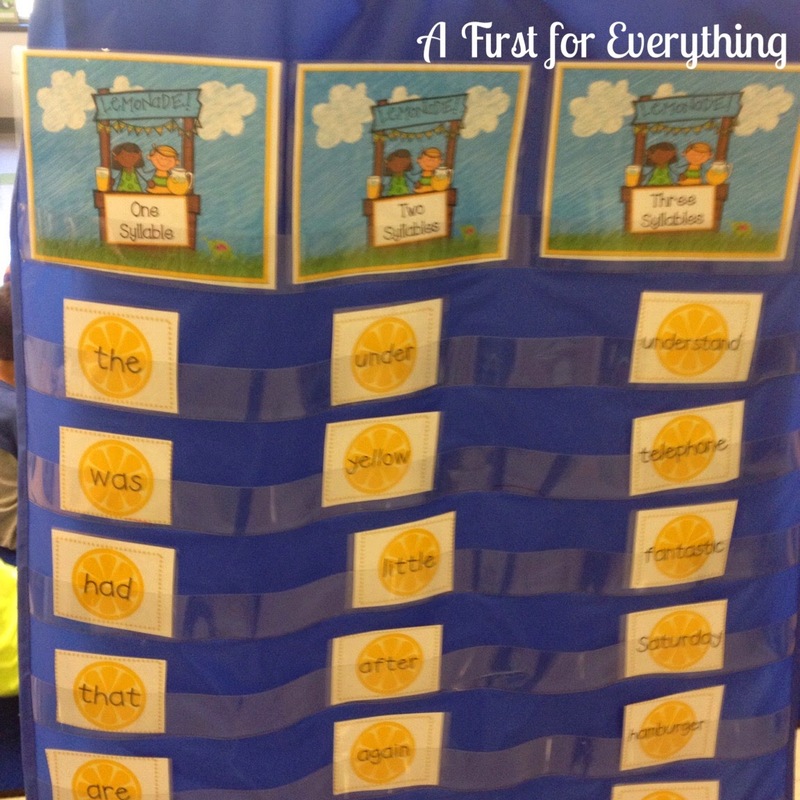 Each student received a word cars, read the word, and sorted it accordingly. 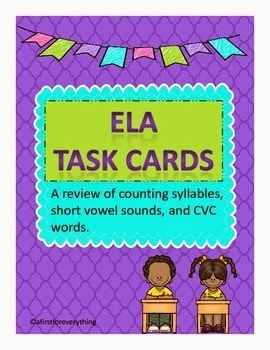 We also played used my syllable task cards from my ELA task cards to count the number of syllables in words. 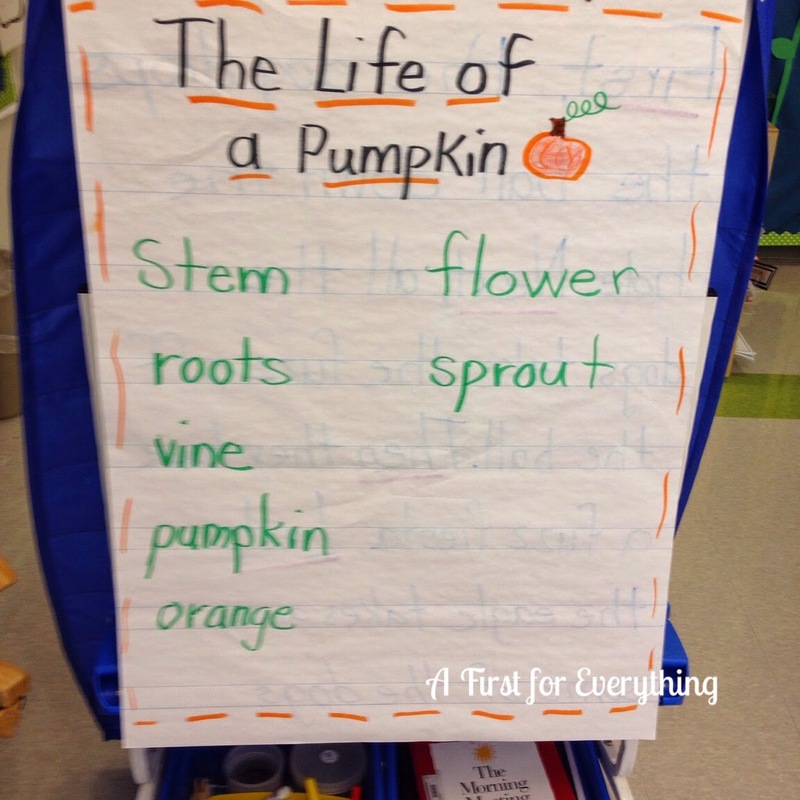 We discussed the vocabulary words within the book and we also came up with our own that were not in the book as we talked about the life cycle of a pumpkin. 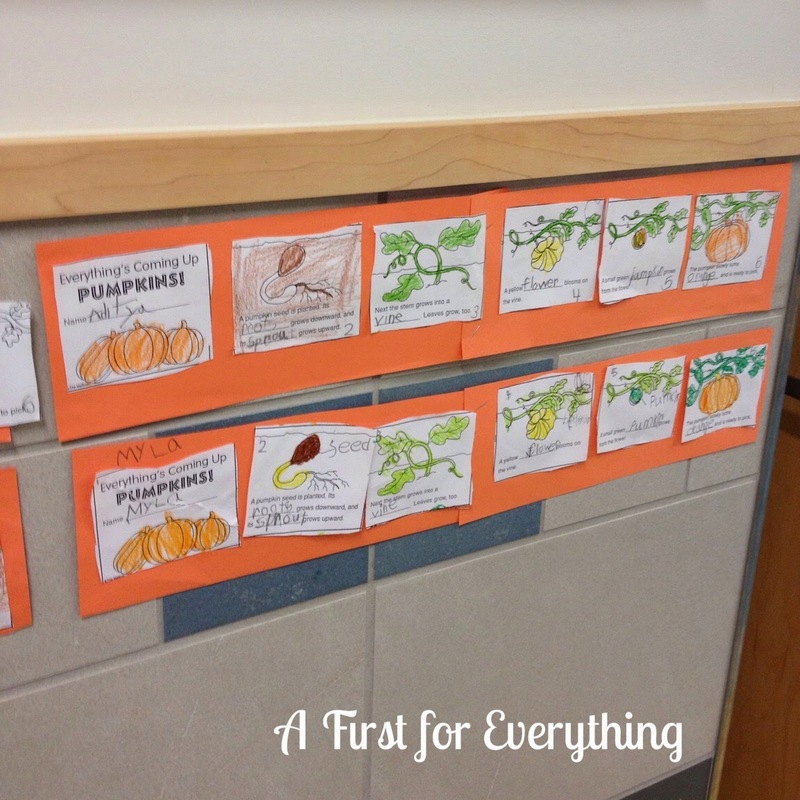 We used the vocabulary words to complete a life cycle of a pumpkin (time line style). We really enjoyed this writing craftivity by A Cupcake for the Teacher. 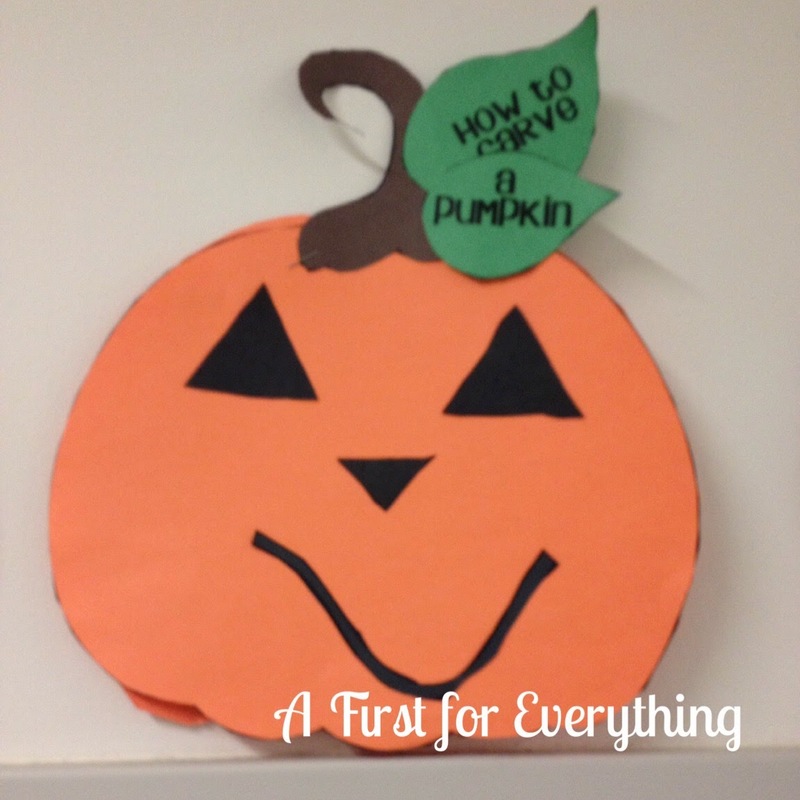 We talked about the steps to carving a pumpkin. 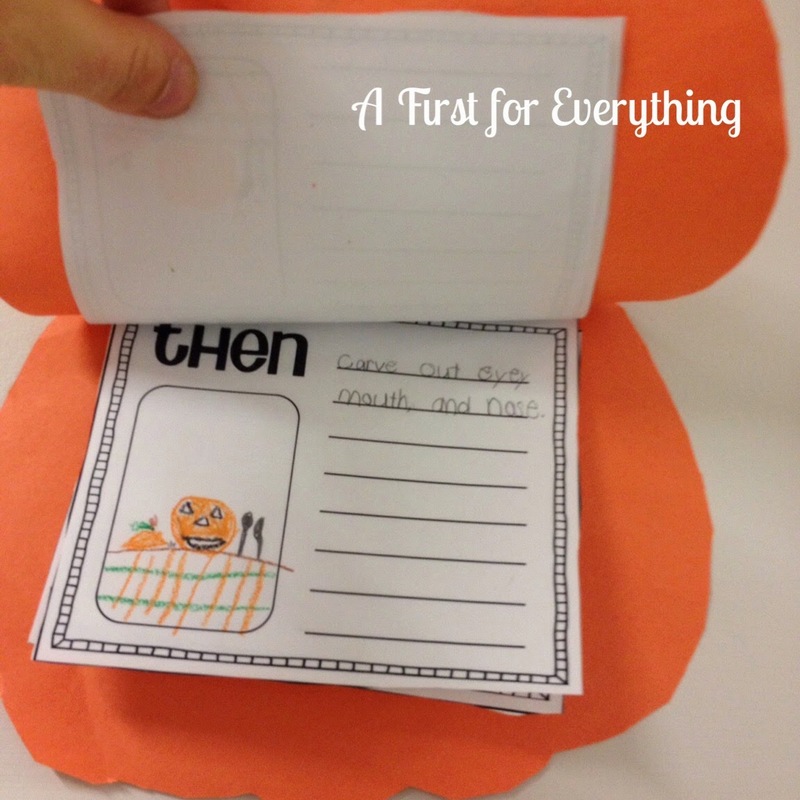 We are learning how to use transitional words in our writing so using the words first, next, then and last, we wrote out each of the steps towards carving a pumpkin and made these adorable flip books. I've made a huge shift towards how I teach math this week. Well, for me it's huge since I don't really embrace change. 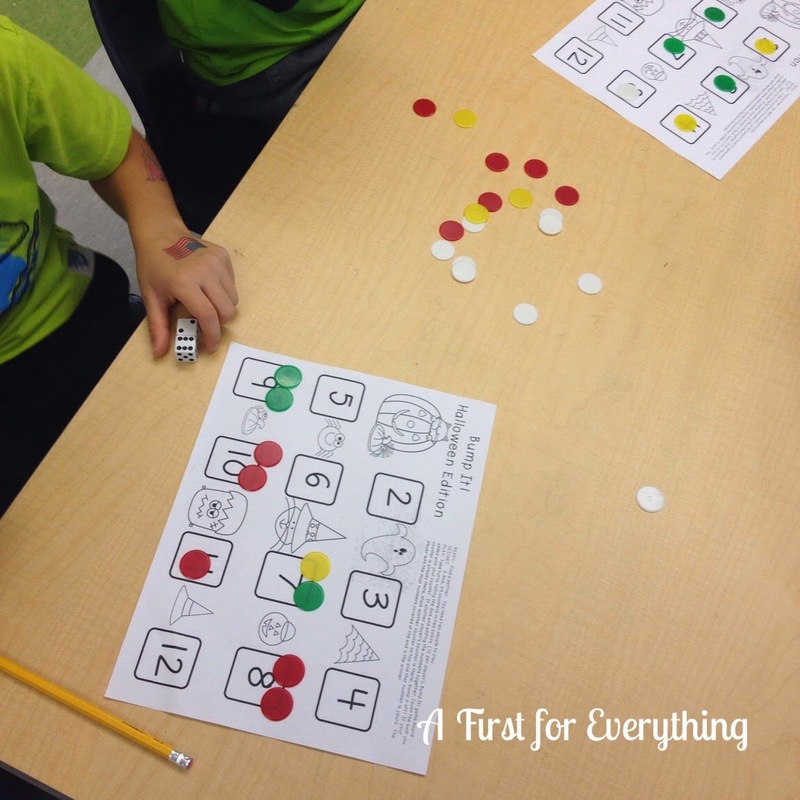 I have begun using a math workshop model. 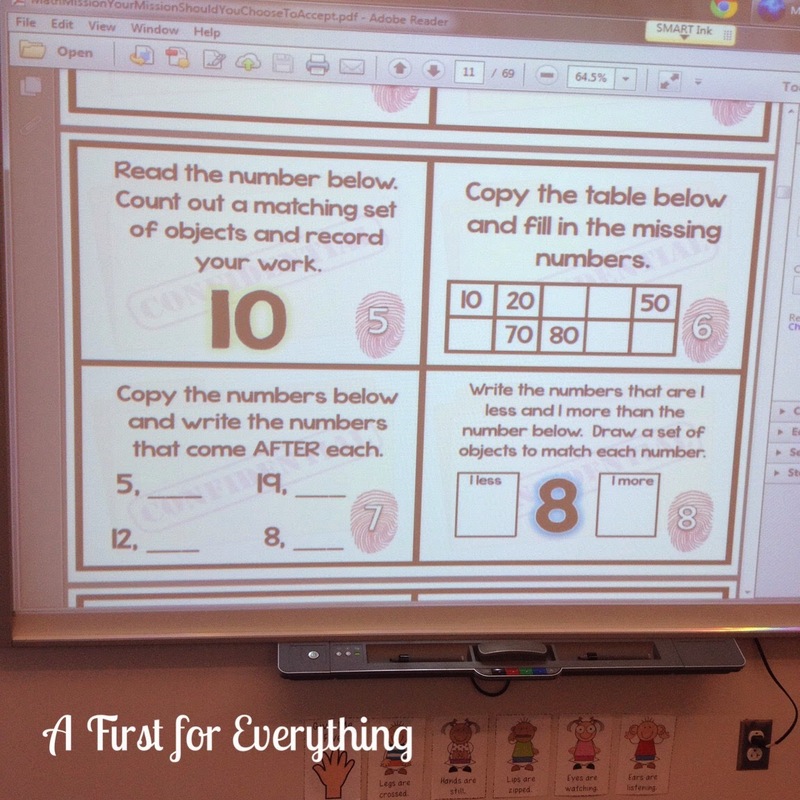 I begin math each day with a 15 minute mini lesson. I have these lessons interactive on the SMARTboard. Then my students break up into five choices. I made this math workshop model menu in Powerpoint so it's nothing fancy. Basically there are 5 choices: Math with my teacher, Math by Myself, Math with iPads, Math with Someone, and Fluency (addition/subtraction practice). I have my groups grouped by ability. This works out really well as it enables me to work with my lowest and highest students at their ability level. Math by Myself is usually our math journal since we use Everyday Math. 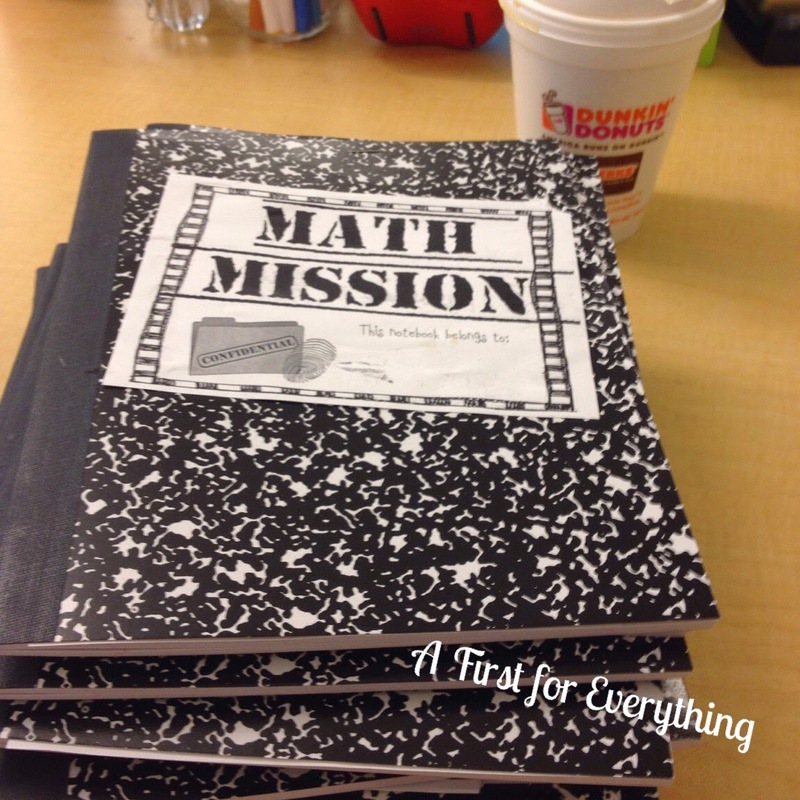 I also use Cara Carroll of the First Grade Parade's Math Mission Product. Here is an example. I usually have the page projected on my SMARTboard. I used these smaller sized composition books for our math missions. 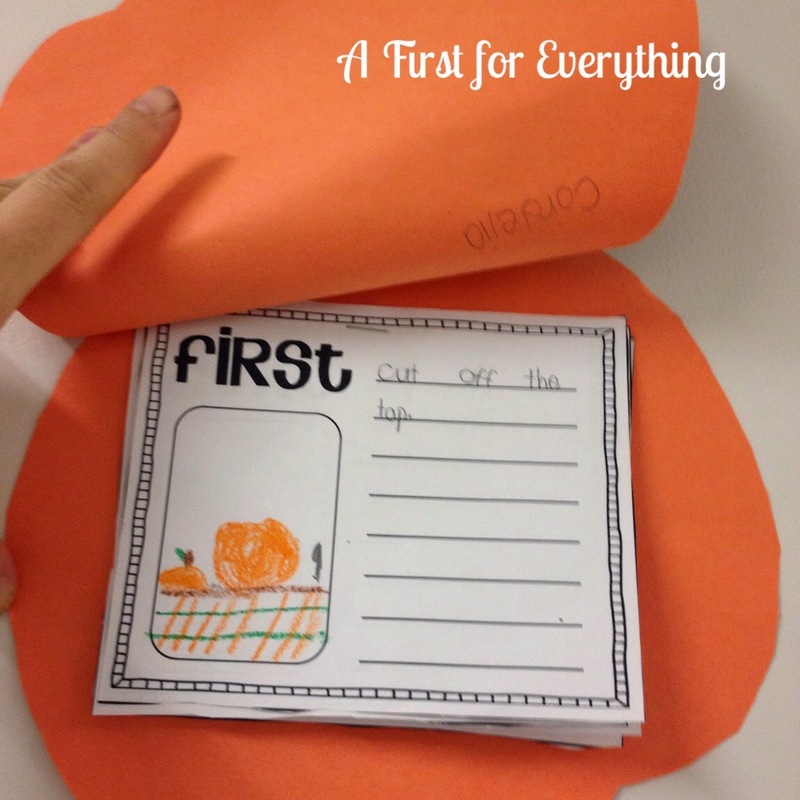 I shrink Cara's missions down to 50% so they fit inside the book and the kiddos glue one mission on each page. 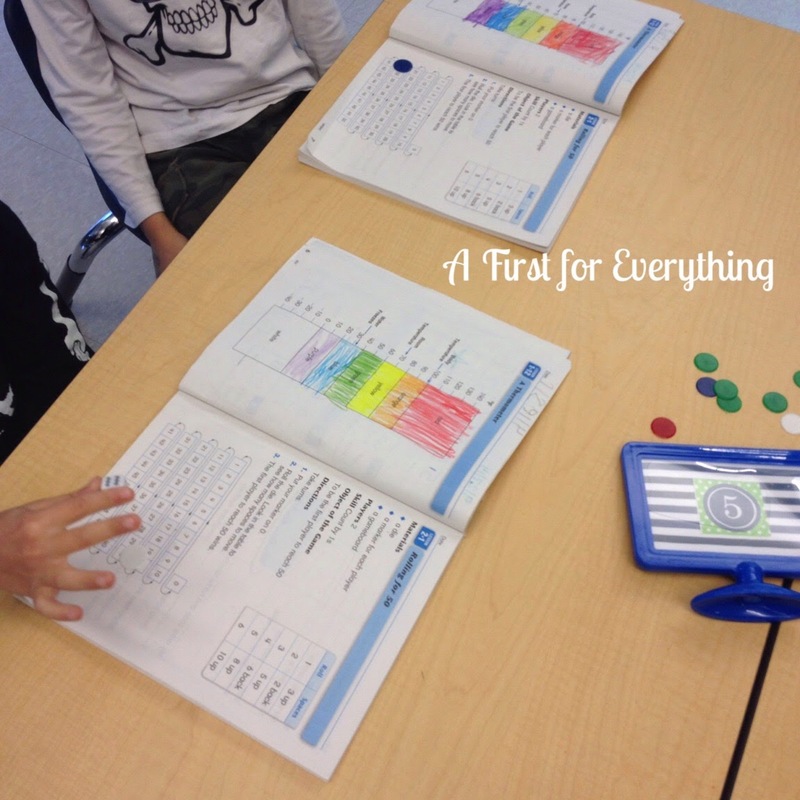 For example, these student has the math mission glued to the top of each page. He is completing mission #5 (pictured above on the SMARTBOARD). 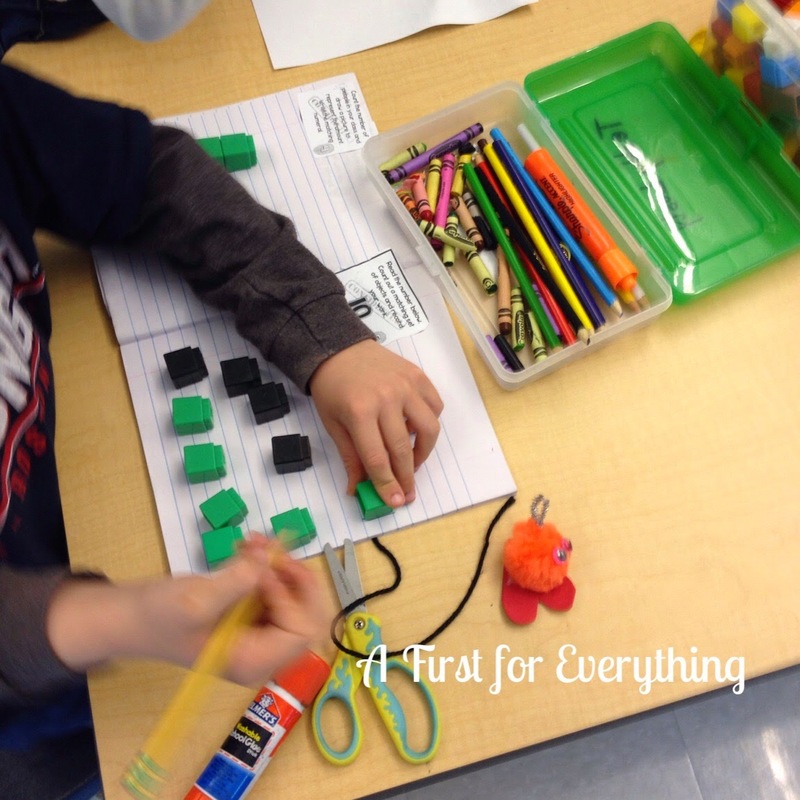 He is using snap cubes to make a set of 10. He is recording how he made his set (5 black on top, 5 green below). 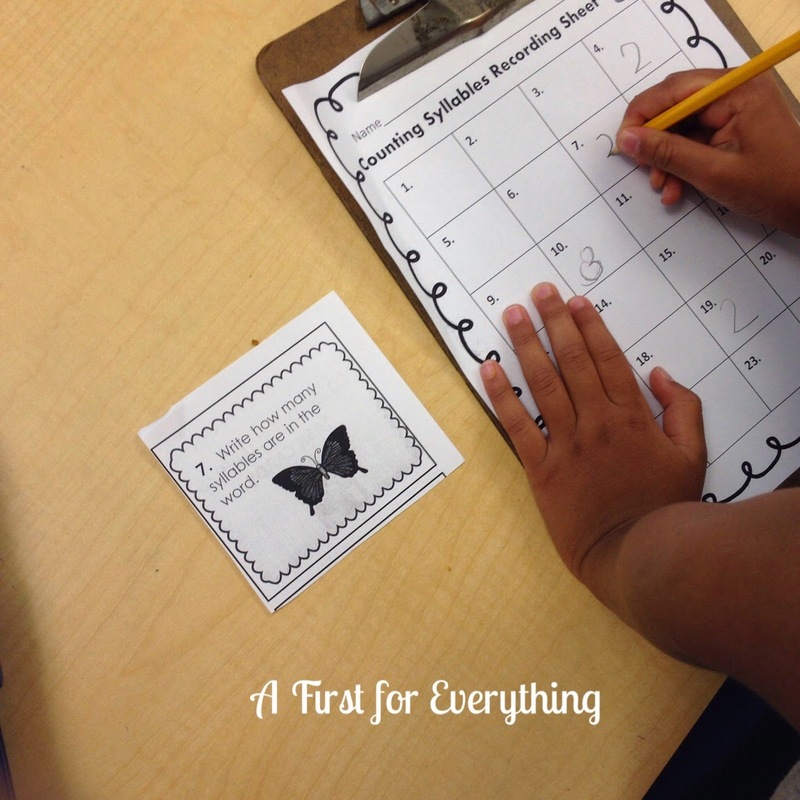 They can take their math mission notebooks anywhere around the room to complete them. These students are playing a game of Halloween Bump (fluency center) as they learn how to combine numbers and number quantities by rolling the dice. 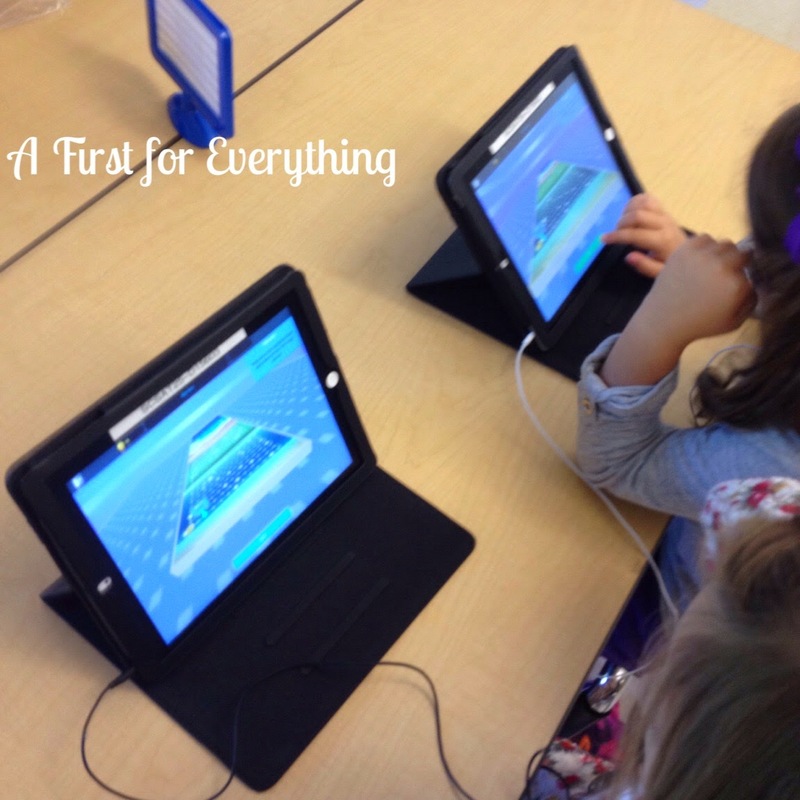 Another group of students are working on the iPads. These students are playing "Race to 50" from our Everyday Math curriculum during Math with Someone. These students are playing "Top it" by flipping cards to determine the largest number. I have about 4 students in each group. This works out perfectly since their are 5 centers and I have 20 students. I am on day 4 and so far I love it. 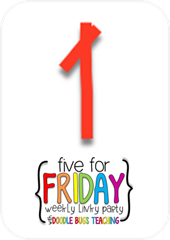 Yesterday one of my kiddos yelled "Yay! It's time for math! I love math workshop!" I'm all about making learning fun again. It's time on learning but they are having fun too. Love that! I am very excited about one of my newest close reading products. It's all about out Fall! You can check it out in my store. Leaves, pumpkins, Halloween, owls, squirrels, bats, spiders, turkeys, Thanksgiving, and Pilgrims are all featured in this inclusive packet. 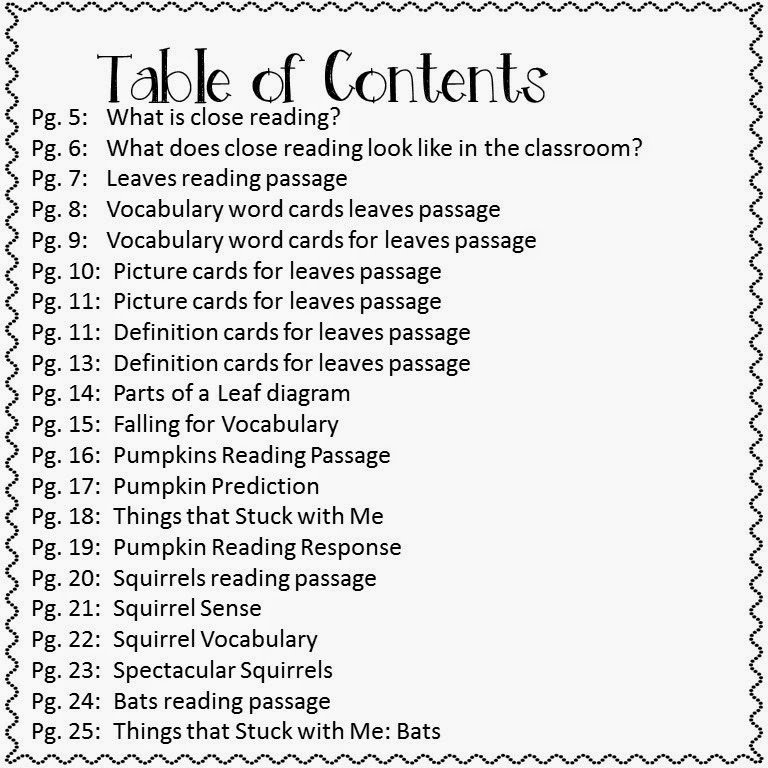 In addition to close reading passages on each of these topics,Thinking maps (webs), vocabulary word cards, vocabulary picture cards,Vocabulary definition cards, read and respond pages, written response pages true/false, compare/contrast, open response questioning (why do you think?... 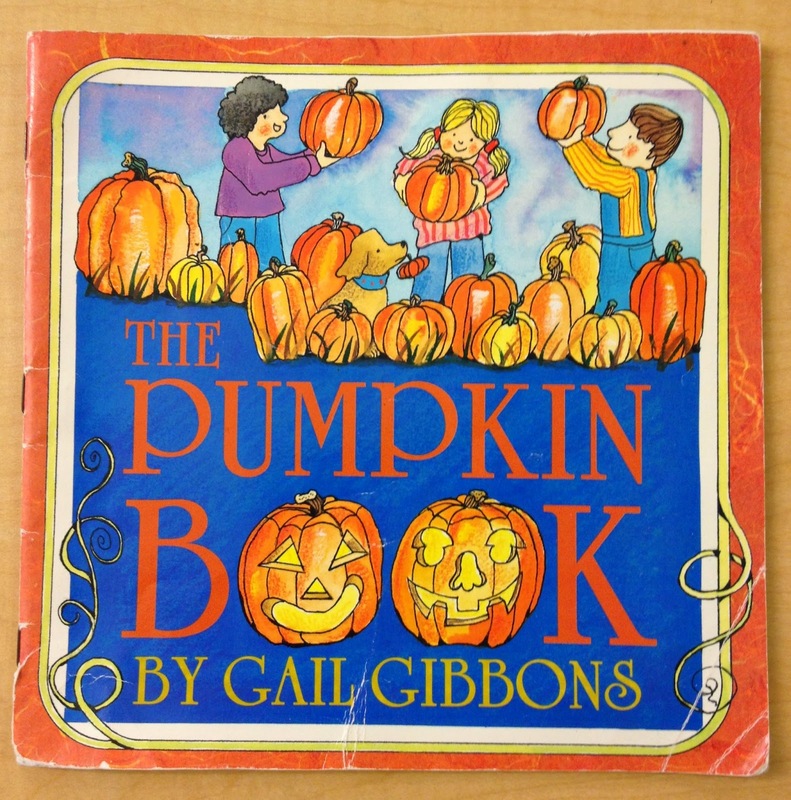 ), word hunt, (how many words can you make with the word Halloween), reflection pages (use your background knowledge and what you have learned from the text-why do you think?..... 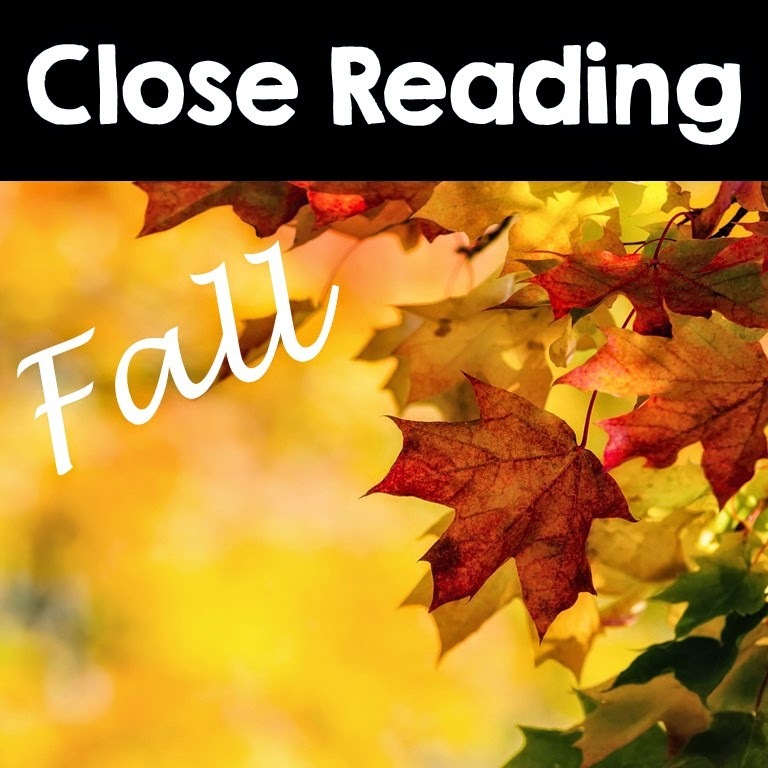 ), identifying key details in text (highlight the part of the texts that tells...), fill in the blank vocabulary, label the diagram, authentic photographs for each topic, a description of what close reading is and description of how I implement close reading in my classroom. How was your week? I love, love, love your comments! I use EDM as well. I too will use math rotations. How long is your math block? HI Hollie. I keep hoping our district will switch to a different math curriculum but until then.....we are stuck with EDM. My math block varies by the day in terms of length. Some days I have 60min, some days 30. I generally do a mini lesson based on the EDM lessons and the next day is a review. So I only introduce a new lesson every other idea. On the days we only have 30 min, we just do a math rotations. I spotted the warm fuzzy. We used those in my classroom too. I made one for each student with their name on the bottom. We kept them in a bucket and I would go around having each child pick one. They wrote a compliment to the child whose name they drew. What a great idea, April! Great post Julie. I am intrigued by your workshop style. How long of a math block do you have? I struggle because I only get 40 minutes a day so I am still trying to figure out how to do a mini lesson and rotations! I plan on trying to get it started next week. Hi Amna! My math block varies by the day in terms of length. Some days I have 60min, some days 30. I generally do a mini lesson based on the EDM lessons and the next day is a review. So I only introduce a new lesson every other idea. On the days we only have 30 min, we just do a math rotations. Sometimes I will even introduce a math lesson during morning meeting and then when math time comes, they hop right into rotations. 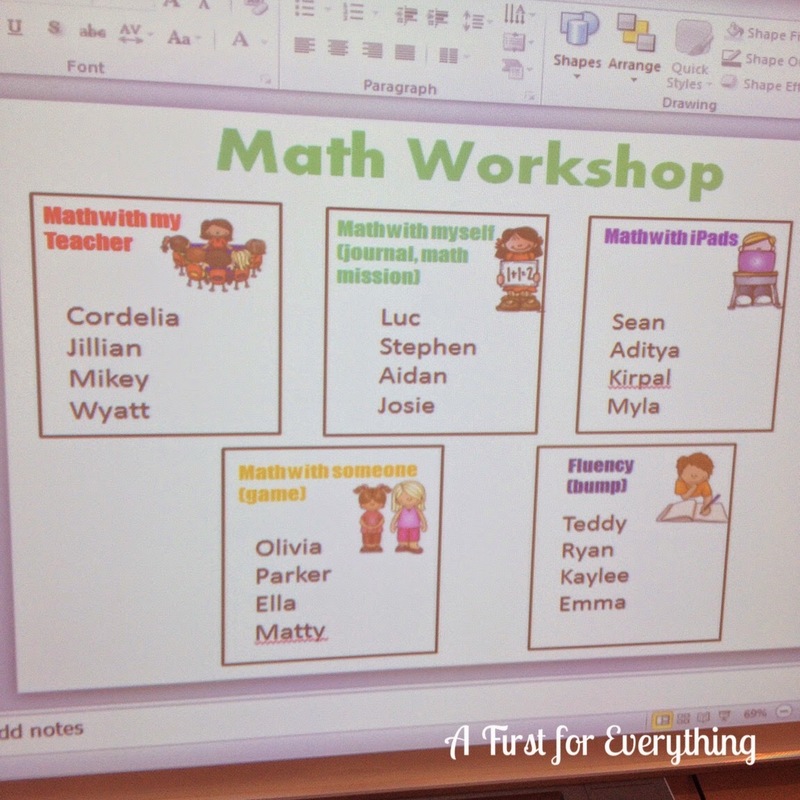 The other day one of my struggling math learners who is "on a watch" yelled out "I love math workshop!" when I announced it was time. That tells me this is working better than large group as I was doing before for math instruction. My district also requires that we spend 10-15 minutes a day on mathematical concepts with those that are struggling and high achievers. So math workshop seems to be an easy way to accommodate that. Love Close Reading!!!!! What a great packet!! I will definitely have to check that out! Thank you so much, Noelle. I just finished a holiday close read and I'm working on a winter close read now.